If the UK holds a ‘Brexit’ referendum on its continued membership of the EU in near future, voters will be hearing a lot about Article 50 of the Treaty on the European Union (TEU), the Treaty provision which regulates the process of a Member State withdrawing from the EU. We have already begun to hear about this clause, with some suggestion that it should be invoked in order to trigger a renegotiation of UK membership. Most recently, a former UK cabinet minister, Owen Paterson, has suggested that the UK should invoke the clause. But what are the legal and political constraints upon using it? (Note that the European Council is the EU institution consisting of Heads and State of Government, and Article 218 of the TFEU is the provision dealing with treaties between the EU and third countries). Article 50(3) TEU then sets out the timing of withdrawal. The UK would cease to be an EU Member State either at the date of entry into force of the withdrawal agreement or, ‘failing that’, two years after the notification of its intention to withdraw from the EU, unless the European Council and the UK unanimously agree to extend that period. (Of course, Article 50 applies to any Member State that might choose to leave, but I will focus my comments on the possibility of the UK withdrawing in particular). According to Article 50(4), during this period, the UK could not participate in discussions concerning it in some EU institutions – namely the European Council and the Council, which comprises Member States’ ministers. A ‘qualified majority’ vote would be recalculated without the UK. Finally, Article 50(5) says that the UK could rejoin the EU again after its withdrawal. This would be subject to the same rules applying to any other country which asks to join the EU. What does Article 50 mean? Article 50 TEU was added to the Treaties by the Treaty of Lisbon. It confirms the possibility to leave the EU that many (but not all) legal observers believed existed beforehand. No fully-fledged Member State has in fact left the EU before or after the entry into force of the Treaty of Lisbon, although some parts of Member States have done so. Before the Treaty of Lisbon, this was accomplished by means of Treaty amendment (an amendment just to remove Greenland was ratified in the 1980s, and Algeria’s independence from France was finally recognised as part of Treaty amendments in the 1990s). After the Treaty of Lisbon, there’s a special procedure relating to small parts of Member States (or their associated territories) becoming less (or more) connected to the EU. But it doesn’t apply to entire Member States, or even to territories linked to the UK (the Channel Islands, the Isle of Man and Gibraltar). So Article 50 confirms the possibility of Member States to leave the EU, and it is clearly the only legal route to leave, as a matter of EU law. There’s no possibility to throw a Member State out of the EU against its will, although its membership could be suspended if there are serious and continued breaches of human rights, democracy and the rule of law (Article 7 TEU). That clause has never been used to date either. What are the crucial features of Article 50? The first crucial feature is the timing of withdrawal. An official notification to withdraw will automatically result in the UK ceasing to be a Member State of the EU, as of two years from the date of notification, unless one of two things happens: a withdrawal agreement sets a different date, or the UK and the remaining Member States (voting unanimously) agree to extend that time limit. Presumably the date of the withdrawal agreement could be set either before or after the two-year default time limit. One important point is not explicitly addressed: would it be possible to withdraw a notification to leave the EU? In the absence of explicit wording, the point is arguable either way. It could be argued that since a notification to withdraw is subject to a Member State’s constitutional requirements, the Treaty therefore leaves to each Member State the possibility of rescinding that notification in accordance with those requirements. On the other hand, it could also be argued that Article 50 only provides for two possibilities to delay the withdrawal of a Member State from the EU once notification has been given (an extension of the time limit, or a different date in the withdrawal agreement). There’s no suggestion that this is a non-exhaustive list. Therefore the notification of withdrawal can’t be rescinded. Would it be possible to circumvent this by the European Council and the UK agreeing to extend the deadline indefinitely? This would probably be open to challenge (and it surely would be challenged in practice by Eurosceptics who wanted to ensure the UK’s departure from the EU). While such an indefinite extension is not explicitly ruled out, the logic and context of Article 50 suggests that extensions of the time limit are temporary. It’s Article 50(5) that expressly provides for rejoining the EU after withdrawal. If the Treaty drafters had intended there to be other means to remain an EU Member State after notifying withdrawal, they would surely have said so expressly. This legal issue has important political implications. It means that it would be foolish, as is sometimes suggested, to invoke Article 50 as a means of forcing a renegotiation of UK membership of the EU. Legally speaking, it’s just not possible to do this. It’s obvious from Article 50(2) that invoking Article 50 leads to negotiations on the UK’s departure from the EU, not about Treaty amendments or changes to other forms of EU law. While it is likely that if the UK left the EU, there would be a separate Treaty amendment agreed by the remaining Member States (at the very least, to remove mentions of the UK from the Treaties), the Treaty drafters clearly did not want Article 50 itself to be used for the purpose of renegotiating EU membership or amending the Treaties in any way. This is obvious when we compare Article 50 to Article 48, which elaborates a number of different ways of amending the Treaties, and to Article 49, which states that an accession Treaty can amend the Treaties. In contrast, Article 50 makes no mention of Treaty amendments. And this makes perfect sense: why should a Member State leaving the EU have a say in Treaty amendments that won’t affect it? Politically speaking, invoking Article 50 as a means of triggering Treaty amendment would be foolish too. Once the UK gives notification of its intention to leave the EU, it will be forced out two years afterward, unless all remaining Member States agree to extend that deadline. So triggering Article 50 in the context of a renegotiation of UK membership would immediately give leverage to all the other Member States: we would be forced out of the EU unless we agreed to whatever terms they were willing to offer. Even if they were willing to be fairly generous, it would look as if we were forced to agree those terms as a condition of remaining a Member State. All this suggests that those who wish to invoke Article 50 as a means of renegotiation actually have the objective of ensuring that the UK leaves the EU. There’s nothing unprincipled when those who openly favour the UK leaving the EU advocate invoking Article 50 to that end. But those who claim to support invoking Article 50 to trigger renegotiation either have a hidden agenda or are quite naïve about what they are suggesting. Secondly, as to the content of the negotiations, Article 50 provides for the negotiation of a withdrawal arrangement, not a deal on the UK’s future relationship with the EU. This is obvious from the wording of Article 50(2), which refers only to taking account of that ‘future relationship’ in the withdrawal arrangement. In practice, the details of the withdrawal arrangement and the treaty establishing that future relationship would be closely linked. Probably the withdrawal treaty would, among other things, aim to regulate a transition period before the treaty on the future relationship entered into force. In this context, it should be noted that (contrary to what is sometimes asserted), there’s no legal obligation for the remaining EU to sign a free trade agreement with the UK. The words ‘future relationship’ assume that there would be some treaties between the UK and the EU post-Brexit, but do not specify what their content would be. This point is politically significant because while the withdrawal arrangement would be negotiated by a qualified majority, most of the EU’s free trade agreements are in practice ‘mixed agreements’, ie requiring the consent of the EU institutions and ratification by all of the Member States. That’s because those agreements usually contain rules going outside the scope of the EU’s trade policy. While it seems likely that in practice the remaining EU would be willing to enter into a trade agreement with the UK (see, for instance, the ‘gaming’ exercise conducted by Open Europe), the unanimity requirement would complicate this. It has been argued that a post-Brexit UK could simply retain its membership in the European Economic Area (EEA), a treaty between the EU, its Member States, and Norway, Iceland and Liechtenstein which extends the EU’s internal market rules to the associated States. I will come back to this idea in a future blog post. But for now, suffice it to say that the EEA includes the free movement of persons, an aspect of EU membership that particularly upsets most UK critics of the EU (indeed, that's why UKIP rules EEA membership out). Although the EEA does contain a safeguard clause permitting the suspension of some obligations, that clause permits the other party to retaliate. So if the UK suspended the free movement of EU citizens, the EU would likely retaliate by suspending access to the EU by the UK financial services industry, and/or removing tariff preferences for UK car exports to the EU. Two final points. First of all, it’s sometimes suggested that that the UK could ignore the Article 50 process, and simply leave the EU without invoking that clause. As a matter of domestic law, that’s certainly correct. Our membership of the EU depends upon the European Communities Act, and Parliament could end that membership by repealing that Act. But politically and economically speaking, this option is insane. It would leave many practical details of withdrawing from the EU unresolved, such as payments of EU funds to UK recipients. Even if the UK could revert its membership of the EEA, that would only govern the trade arrangements with the EU, not issues outside the scope of the EEA. For instance, it would immediately end the UK’s involvement in the European Arrest Warrant (EAW). Unless we had negotiated a transitional and/or replacement arrangement – which is obviously the point of having the two-year period set out in Article 50 – defence lawyers would argue that any EAWs which the UK had issued to other Member States, and any EAWs issued by other Member States which the UK was seeking to execute, were invalid. That would mean that no fugitives could be arrested or detained on the basis of those invalid EAWs, and those already detained would have to be released. More broadly, such a ‘unilateral declaration of independence’ would destroy the UK’s credibility as a negotiating partner with the remaining EU, and indeed with anyone else, given the clear contempt that it would display for the legal rules which the UK had previously accepted. It would be a long time before the UK could plausibly claim again that it had a record of ‘fair play’ in international negotiations. Finally, what about Owen Paterson’s specific suggestion that the UK should leave the EU before holding the Brexit referendum – which would then be a choice between EEA membership on the one hand, and full EU membership (including participation in Schengen and the single currency on the other)? The basic problem with this suggestion is that it is utterly and totally undemocratic. Over the last twenty years, the UK constitution has developed an unwritten convention that major constitutional changes need to be approved by a referendum. This convention has only once been applied at national level during this time (as regards changes to the voting system), but it has frequently been applied in regions and cities across England, as well as in Scotland, Wales and Northern Ireland. Leaving the EU is clearly such a major constitutional change that a referendum is required before it happens, not after. Indeed, this is recognised by David Cameron’s policy of renegotiation and a referendum. It isn’t clear from the UKIP website whether that party would hold a referendum before leaving the EU or not, although that party’s leader has made reference to a referendum pledge as a condition of supporting another party after the next general election. This now-established principle of the British constitution cannot and should not be set aside for the convenience of securing a tactical advantage for those who dislike the EU. Paterson’s suggestion would in fact rob the British public of voting either for the status quo of EU membership (which does not involve the single currency or Schengen) or for any renegotiated agreement which David Cameron might renegotiate (which will also surely not involve either feature of EU law). A Brexit referendum should never be held on such an unprincipled basis. Utterly and totally undemocratic? I disagree. It would be the first honest choice ever put to the British people on the subject. This is the core choice here: euro-federalism or independence. Anything else is a deception. My point (which you don't address directly) is that leaving the EU without a popular vote is undemocratic. Your suggestion is a false choice: there are lots of forms of partial participation in the EU, including the status quo and whatever Cameron might renegotiate. So it would still be an honest choice between that degree of participation in the EU and leaving the EU entirely. Anyway, being an EEA member, as Paterson suggests, means applying much of EU law without having any say in it: that's a very odd form of 'independence' indeed. Would not a GE, with art 50 invocation as a policy of a winning political party, be a democratic mandate for withdrawal? Absolutely not. It's been 60 years since a UK political party won over half of the vote, and it's possible that a party could get a majority in the next general election with under 35% of the vote (on a turnout below 60%). Plus people might have voted for that party for different reasons, and a government that will make all decisions for five years shouldn't be elected on one issue alone. It would only be democratically legitimate (and constitutional) to leave the EU on the basis of a referendum, in light of the significant impact on the country of leaving the EU. Eurosceptics have called for an in/out referendum for years, why try to rig the result now? Plus this argument would set a great precedent for the SNP to claim that a majority in the next Scottish election is a vote for independence; is that what Eurosceptics want? So entering the Common market and agreeing changes to the rules were also totally undemocratic. The imposition of EU citizenship was undemocratic the EU arrest warrant was undemocratic. It seems you want to ignore all the undemocratic underhanded methods used to get to this point. I agree that, since it was a significant change to the system of government in the UK, entering the Common Market had dubious democratic legitimacy - until it was subsequently approved by a referendum. But at that point there was no tradition of referendums for significant changes of the system of government, so there was a stronger argument that the votes of MPs provided sufficient legitimacy. Now there are two overwhelming arguments that leaving the EU without a referendum would be unconstitutional: (a) it would overturn the result of a previous referendum; and (b) it would constitute a significant change in the way in which the UK is governed. Neither of those arguments apply to the previous Treaty amendments (taken individually), or to the introduction of EU citizenship (which stemmed from a Treaty amendment) or the EAW. All of these were approved by a majority of MPs, hardly undemocratic. But I do agree that all of the changes to the EU since 1975, taken together, are sufficient to make a strong case for a new referendum on whether the UK should remain a member. It puzzles me, though, that anyone who wants the UK to leave the EU would want to avoid a referendum. If the case against the UK's membership of the EU is so strong, why don't you think the British people could be convinced of it? I agree with your overally notion that to use Art. 50 for renegotiation is nonsense, but why do you conclude that the notification could not be rescinded? You are right that the Treaties provide limited number of options how to proceed afterwards, but they do not preclude unilateral withdrawal of the notification either. Taking the pro-integrative notion of the EU ("ever close union"), protection of EU citizens rights, the principle of loyal cooperation etc., you think the state will act ultra vires if it changes its mind? If your logic of exhaustive list is applied to its logical end, how can the EUCO even unanimously agree to accept withdrawal of the notification (it could only prolong)? The possibility of rescinding a withdrawal notice could be argued either way. But unless it were absolutely certain that it were possible to rescind it, it would be foolish to use it as a tactic to trigger a renegotiation. Eurosceptics would surely litigate against any purported rescission of a withdrawal notice. And yes, if the withdrawal notice can't be rescinded in the first place, then the European Council couldn't agree to accept a rescission, or to circumvent that rule by prolonging the withdrawal talks indefinitely. Hmm....even though you said you will come back to the idea of EEA membership as an alternative to EU membership in a future blog post, I have an observation and a question. Firstly, if I've read the EEA agreement correctly one can only be a member of the EEA by either being a member of the EU or EFTA. So in that sense the EEA Agreement would be more correctly described as a treaty between the EU, it's Member States and EFTA and it it's member states with the exception of Switzerland, would it not? Secondly, you noted that "the EEA does contain a safeguard clause permitting the suspension of some obligations," but "that clause permits the other party to retaliate" and go on to give the example of the UK suspending free movement and the EU (or rather other EEA members) retaliating by suspending access for UK financial services and/or removing tariff preferences for UK car exports. But in reading the Agreement, the safeguard clause you seem to refer to (across Articles 111-114) would seem to suggest that these safeguard clauses could only be invoked unilaterally by the UK provided that it informed all the other EEA parties and consults the EEA Joint Committee, etc. The retaliatory clause seems to be Article 114 which allows for the other parties affected by imbalances due to the safeguard measures invoked to take "proportionate rebalancing measures as are strictly necessary to remedy the imbalance. Priority shall be given to such measures as will least disturb the functioning of the EEA." That sounds more to me like if the UK were to suspend free movement that the rebalancing measures by the EU would have to be in relation to imbalances created as a result of the suspension of free movement by the UK, does it not? Neither Articles 111-114 or 102 (which seems to allow for suspension of part of the EEA Agreement when new EU legislation makes changes to the Annexes of the Agreement which the other EEA member states cannot implement for some reason) seem to allow the UK to suspend existing free movement just because the UK wants to do so though....it would seem the UK would either need to suspend it via Article 102 based on NEW changes to the freedom of movement rules or if there is a dispute over the interpretation of the free movement clauses (Article 111) or if serious societal, environmental or economic difficulties were to arise and persist as a result of continued free movement (good luck proving that!). On the first point, the UK could simply join EFTA to satisfy that condition. Secondly, there would perhaps be legal challenges to any use of the safeguard clause on both sides, before the UK courts (though the EFTA Surveillance Authority might sue the UK in the EFTA Court) and the CJEU. But the ultimate authority on that issue would be seem to be the arbitration board to be set up under Article 111(4) of that treaty, which could give a binding ruling on the scope and duration of the safeguard and any retaliation against it. I don't think it's self-evident that retaliation would have to take place in the same sector as the original safeguard; compare to the WTO rules on retaliation against breaches of the WTO, which state a much clearer preference for same-sector retaliation. It would definitely make for an interesting legal case played out in the courts as to whether "proportionate rebalancing measures" would imply that such measures had to be in the same sector. It would certainly be quite an exercise to determine the proportionality of such retaliatory measures though and such measures would probably have to be different for different EU members given that a theoretical EFTA/EEA-UK suspension of free movement would affect different EU or EFTA/EEA members differently. After all if the UK suspends free movement under such a scenario, the effects on Spain (with Spanish migrant workers moving to the UK and many retired Britons moving to Spain) would be different from the effects on Poland (many Polish migrant workers going to the UK but few Britons moving to Poland) and the effects on both Spain and Poland would be different from the effects on Germany (not many Germans proportionally having moved to the UK and vice versa). In such a case the European Commission response would have to take into account the various different effects in coming up with the appropriate rebalancing measures on behalf of the European Union as a whole. I am afraid that there is one factor non been considered here: Spain and Gibraltar. And I mean this because there are more and more voices in Spain asking for closing the border again, now that Spain has just withdrawn the only presence it has in the Rock, the Cervantes Institute (equivalent to the British Institute). When accesion negotiations opened with Spain, the UK was clear that Gibraltar was already part of the EU, that it enjoyed the 4 free movement freedoms and that it was not possible that the border between two Member States remained closed. Spain was forced to open the border between Gibraltar and Spain before becoming a Member State. The only barrier to Spain closing the border again again is EU Law and its four freedoms. If these disapear, Spain can legally close the border again. First, any renegotiation of the Treaties would need the agreement of Spain in relation to the Gibraltarian border or its tax haven status. Eventually renegotiation can be made conditional to Gibraltar leaving the EU and Spain be allowed to close the border again. This would leave Gibraltarians isolated and poor again, since their economy and daily live is dependent of the Spanish land. Therefore, not counting with Spain's potential veto in the renegotiation of the Treaties or the extension of the deadline of an Art. 50 is not been realistic. In fact Gibraltarian press talks about it all the time, but I do not know why the British press pays no atention to it. The second point is that since the Accesion Act included Gibraltar, would it still be possible to apply for exit (art. 50) with an application that is not applicable to Gibraltar too?. Then the UK would leave and Gibraltar would remain? Would the Spanish veto still be applicable? I believe that an Art. 50 application would probably be the only possibility for Gibraltar to remain in the EU and avoid Spain's veto. This is just one example of one Member State that has a national interest to that of the UK in the renegotiations and is likely to use its veto. I believe that realistic options for the UK to get an apropiate renegotiation are very few. Honestly I believe there are only two options to avoid the veto from Spain, leaving and joining the current EFTA or just leaving completly. As you say an Association Agreement would also face the veto from Spain in relation to Gibraltar. As you can see, Gibraltarians are very concerned about what the UK is doing. I hadn't thought about this angle. I wonder if Podemos is just as hardline on Gibraltar, given the odds that they will part of the Spanish government soon? The four freedoms do not fully apply given that Gibraltar is exempt from the customs union and CAP. The Treaties would not be renegotiated from scratch, so any change in the position of Gibraltar could only happen if Spain insisted on it as a quid pro quo for the amendments that the UK wanted. I would point out that Spain has not demanded such changes as part of the last few sets of Treaty amendments. Gibraltar is referred to indirectly in the main text of the Treaties; I assume that in the event of Brexit the remaining Member States would amend the Treaties to remove that reference along with all other references to the UK. I can't see a realistic scenario of Gibraltar staying as part of the EU after Brexit (unless you want to join Spain :)). Joining EFTA and therefore the EEA would raise the same question of territorial scope since Article 126 of the EEA treaty just refers back to the EU treaties. If references to Gibraltar are removed from the EU treaties, then that doesn't resolve the situation any more. Presumably after Brexit the UK could seek to negotiate special rules on Gibraltar as part of a post-Brexit deal, but in that case Spain would hold the upper hand on this issue. I rather doubt that UK politicians would trade the interests of voters in the UK for the interests of a territory which doesn't vote in UK elections. Podemos would leave things as they are now, so no changes concerning GIB. They are more interested in changes is EU monetary and fiscal and that is not so easy to change as Greece has seen recently. The reason Spain never raised the hand in the negotiations of the Treaties in the past is that GIB and the UK were never the issue of the reform, and therefore such a standing by Spain would have never been accepted by other Member States. For the same reason the UK has never been able to negotiate anything related to his special EU status when the Treaties were reformed. UKIP says the UK could block reforms of the Treaties in exchange of a special status. That shows they do not know how these negotiations really work. The reforms deal a certain number of issues and nothing out of those issues are ever dealt in the negotiations. Yes you can opt out of what is being negotiated but not from issues that are not part of the reform. However, if the next reform deals exclusively with the UK, then the Member States will accept that each Member State defends his interest against the UK, because that will be the main focus of the negotiation. Legally the four freedoms apply fully as such even if GIB is not part of Schengen, Customs Union, VAT area and Excise area. Spain cannot stop a Gibraltairan citizen from crossing the border or estabish himself in Spain. The fact that GIB is out of those policies allow Spain to control the border and perform long checks, that is all. I agree that the UK politians will happilly get to an agreement with the EU (and therefore Spain) disregarding GIB, and that is what Gibraltarians are now scared of. Moreover, another issue is also starting in Cyprus with the population living in the Sovereign Bases. Right now the land is out of the EU and in the all Treaties it was suposed to become part of the EU the day of the accession of Cyprus and granting rights to civilian population living there. Then the protocol was deleted. Cyprus wants that population to have rights and be represented in the Military Government of the Sovereign Bases, because right now they are foreigners living in British land without any political and civil rights. So as you see there is a lot to negotiate that the UKIP has not yet thought about. Think also about the current status of the Channel Islands and the fact that Germany and France want them to finish with the tax haven status. The negotiations will be long and messy. In fact, by now I am convinced that there will never be a referendum dealing with the Brexit. It is either leaving or staying as it is now. 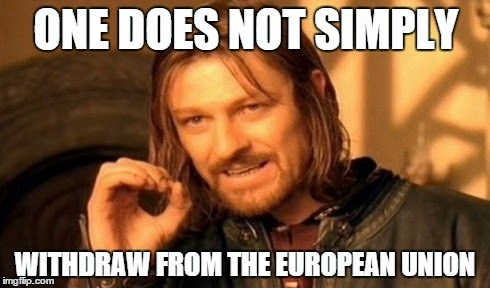 There is another method of withdrawal that has some precedent, though not in the legal sense and that is the scorched earth policy whereby a State simply declares that it no longer recognises the Treaty or the authority of any European Institution and refuses, point blank, to attend or respond to any attempt to communicate over the matter. This is the historic route - all Treaties are only as binding as the Parties to them are willing to be bound. Once expediency enters the picture all bets are off and the Treaty is cited variously as illegal, unjust, unConstitutional, etc and becomes just another piece of paper. As to how far the EU's reach extends and what consequences there would, or might, follow for the State having taken such an action, is another matter. Ultimately, trade is king in this world and there are plenty of nations not affiliated to the EU that would in all likelihood not join in with any collective punishment measures imposed. Withdrawing from the Declaration of Human Rights, on the other hand, would likely have profound consequences for the nation concerned. Ultimately that is no different from the policy I describe in the blog post, ie unilaterally ending the legal force of EU law in the UK by means of an act of parliament, and not following the withdrawal procedure in the Treaties. For the reasons I set out it is a very stupid idea, as the UK would wish to trade with the EU after withdrawal and such a unilateral move would damage the UK's relationship with the remaining EU (and reduce the number of the remaining British jobs that depend on such trade) for no very good reason. The above proposal by Anonimous does not take into account that the EU is not just a free trade zone. Yes, trade is king nowadays. yes, there will be Members States still willing to trade with the UK after Brexit. The problem is that they will not be able to do it unless the EU decides so. Trade and customs policy are an exclusive competence of the EU, so unless the EU negotiates an agreement with the UK, the kind of exit you propose, denouncing the Treaties, will oblige to treat the UK as a completly foreign country, imposing customs duties, trade defense instruments, etc. Leaving the EU like that, without having negotiated an association agreement before, would not be intelligent for the UK. A unilateral 'scorched earth' withdrawal by the UK from the EU as suggested above (3 March 2015) would also leave the UK open to adverse judgments from the CJEU and possibly the ECtHR. The UK could ignore those judgments but it would have to deal with their potential consequences internationally - i.e. possible seizure of state assets in default of payment of fines etc. Professor Peers. Thanks for this post, I recently wrote a Ukip article http://www.jamesbickle.co.uk/2015/03/ukip-fever.html - Ukip supporters suggested to me it would all be fine as The Lisbon Treaty made provision for a post exit EU wide free trade agreement. I thought 'I bet it doesn't!, sounds unlikely to me' but good to have it confirmed. It's certainly possible to have a post-Brexit free trade deal between the UK and the remaining EU, and perhaps it's even likely. But it's not absolutely certain, and the details would have to be negotiated, unless the UK simply reverted to membership of the EEA - but UKIP objects to that possibility. Could the UK stay in the EEA, while leaving the EU and joining EFTA, and thus avoid the normal EEA accession process under Article 128, which would require ratification by the European Community and 30 (27 + 3) member states? Piris (http://bit.ly/1T0NaQh) said no to this, but Richard North (http://bit.ly/1UxZWF4 p. 74-5) cited the EFTA Secretariat as saying that there is no definitive answer, since the EEA Agreement does not specify what happens if a party ceases to be a member of the EU, and that it would be a political decision. What happened when Austria, Finland and Norway left EFTA and joined the EU in 1995? Did they leave EFTA on the same day they joined the EU? Did they have to re-apply to the EEA? In my view there is very clearly no way to avoid an EEA accession process. Article 2(c) EEA says that the parties are the Community and its Member States. If the UK ceases to be an EU Member State, it cannot therefore be a party to the EEA unless it becomes an EFTA state and goes through the accession process. This is confirmed by the financial protocol which refers to the individual EFTA States (see the current Protocol 38b); this cannot mean that the UK can become an EEA member without making a financial contribution, in light of Articles 115-117 EEA, which refer to all the EFTA states making a contribution. Even if it is a purely political decision, why would the EU agree to this interpretation? As for the 1995 accession, the 1994 Accession Treaty stated that the new Member States had to leave EFTA (see Article 61 of that treaty, for instance). Their participation in the EEA is covered by Article 128 of that Treaty, which refers expressly to the possibility of states joining the EC. It says there is an obligation to join the EEA, subject to the negotiation of a treaty between all parties setting out the details. There was an accession treaty to this effect. Thanks very much. I guess there could be some hard bargaining over the UK's financial contribution, if the recipient countries have a veto on our accession. Generally, since we helped to found EFTA in 1960, and then applied to the EEC in 1961; then, in this scenario, had just decided to leave the EU, after making fulsome promises re our commitment to it in 1973; then applied to join EFTA, and the EEA - but in Richard North's proposal, only as a temporary measure, really to ease our exit from the EU - then I would have thought that more than one of either the EFTA or the EEA nations, might be wary of having us back in. Do you happen to know where I might locate that EEA Accession Treaty for Sweden, Finland and Austria? I have looked at http://www.efta.int/legal-texts/eea and similar, but unsuccessfully so far. Yes, if the UK announces that its intention is to use the EEA only as a stopgap, I think that could reduce any interest in UK membership from the other parties' perspective. I can't find the EEA accession treaty for those states either. I will keep looking. Perhaps it was deemed unnecessary to have one for States which were party to the EEA anyway as EFTA states, just before joining the EU? The EEA Agreement seems to have been amended 6 times - see the updated version at (http://bit.ly/1d4rKbQ). There was an Adjusting Protocol (March 1993) after the Swiss dropped out, and an Enlargement Agreement (April 2004), but there is no sign of it being amended when Finland, Austria and Sweden joined the EU. There are just two explanatory footnotes on page 5. Does the 'And' have any legal significance? That is to say, the Agreement is between The European Community, Belgium ... the United Kingdom AND Iceland ... Norway. Is the Agreement to be thought of as bilateral in any way between EFTA and the EU; or is it simply multilateral between the 32 parties? If the latter, then perhaps it made no legal difference when Sweden, Finland and Austria hopped to the other side of the AND. If that were the case, could we then possibly do the same thing, but the other way around? That is to say, apply to join EFTA while still in the EU (during the 2 year Article 50 period), and then join EFTA (if our application were successful) the day we left the EU. And simply stay in the EEA, with no need to amend the Agreement. I don't think it's legally possible to hop the other way around. The parties are the EU, its Member States and those EFTA states that signed the EEA. Sweden etc simply switched from being EFTA states that signed the EEA to being EU Member States. But if the UK leaves the EU it is no longer an EU Member State; it would therefore have to become an EFTA state that signed the EEA. Article 128 EEA says in that case the UK has to negotiate its EEA participation with the other parties. If Austrian, Finland and Sweden were excused from this on the basis that they were already in the EEA, I don't yet see why the same would not apply to us. But Article 128(2) EEA says that there must be an accession treaty. As I say, the UK would be in a different position from Sweden etc because it would no longer be in one of the categories of countries listed in Article 128(1). Would we not be 'a European state becoming a member of EFTA'? Yes, and therefore subject to an obligation to negotiate an accession treaty under Article 128(2). Even if it were possible to skip this step as was (possibly) the case re Sweden etc, it was presumably the EEA parties that *chose* to skip this step. Why would the EU choose to skip it? Might it perhaps have been argued in the case of Austria, Finland and Sweden - and could it be argued similarly in the case of the UK - that it is not possible for one of the EEA Contracting Parties to 'apply to become a party to this Agreement', since they are already a party. Therefore the terms of Article 128 are not relevant in these circumstances. Or, could there be a legal argument on the basis of precedent, that the UK should not have to apply, since A, F and S did not have to? I would have thought that this would at least constitute a political argument. All the above assuming that Austria, Finland and Sweden did not in fact have to make an application. One problem with the argument is the financial contributions. They are specifically referred to in the Protocols, and there is no reference to the UK there. In fact the Final Act to the EEA specifically anticipates the possible accession of EFTA states to the EU and details the solution which will apply. There is nothing to anticipate what happens the other way around. The idea of being a party to the EEA without making a financial contribution violates the main text of the agreement. So at the very least the UK would have to negotiate financial aspects in order to become a party as an EFTA state. I would expect the EU to argue against your legal interpretation very strongly, either on the basis that the parties expressly provided for EFTA states to join the EU, but not the other way around, and/or that the parties mutually agreed to waive Article 128(2) on that occasion, but this doesn't bind them to do so on this occasion (this is quite different from a binding case law precedent). At the very least, the EU would only be willing to waive the requirement again subject to conclusion of other negotiations with the UK, on financial issues and agriculture/fisheries. In any event, if the UK claims to be an EEA member and the EU says it isn't, there's no court with jurisdiction over both of them - the EU not being a UN member and so not directly subject to jurisdiction of the International Court of Justice. Some on the Leave side hate the EEA too, and so could litigate in the UK to argue that there is no valid accession. The CJEU would probably be asked to rule on the point for the EU side. (In fact the CJEU could be asked to clarify these or other points in advance, by means of Article 218 TFEU). If the EU does indeed not accept your interpretation, then relying on an assumption that the UK would somehow win this argument, without access to any court or other mechanism with jurisdiction to decide it, is surely a political non-starter due to the economic uncertainty that it would create. Article 116 EEA Agreement stipulates, as you say, that there shall be contributions from EFTA to poorer EU states or regions. Also there is Article 82 on EFTA contributions to Community activities. Protocol 38b names the EFTA states and specifies their total contribution with respect to Article 116. This was a Council Decision (http://bit.ly/1TuQ4ad) This protocol was inserted by an agreement between the EU and the EFTA states. I can see that this would have to be updated if the UK were to transfer to the EFTA side of the EEA, and therefore that agreement from the EU would be needed. Excuse my ignorance, but would the EU side of this ultimately be by QMV or could a single state veto it? In another case, this time related I think to Article 82, financial contributions were set by adding Article 19 to Protocol 31. This was done in 2000 by a decision of the EEA Joint Committee, which now has the EEAS on the EU side. (http://bit.ly/26XvXvo) So again, it looks like agreement with the EU would be needed, one way or another. In the Final Act, I found the 'Joint Declaration concerning the Financial Mechanism', which starts 'Should an EFTA Contracting Party withdraw from EFTA and accede to the Community...', and as you say does not consider the possibility of a state withdrawing from the Community and joining EFTA. So I think I am persuaded that the UK would at least need to reach agreement with the EU (I guess this means the Commission in the first instance, or perhaps the EEAS) in order to transfer over to the EFTA side of the EEA. Then, as you say, perhaps they would waive Article 128(2). The proposal to approve the latest financial mechanism agreement, along with a fisheries trade agreement, is here: https://ec.europa.eu/transparency/regdoc/rep/1/2016/EN/1-2016-86-EN-F1-1.PDF It has the dual legal base of trade (commercial policy) and cohesion policy. Presumably the trade legal base only relates to the fisheries trade aspects. This agreement was negotiated by the Commission on the basis of a mandate from the Council. It needs be signed and concluded by the Council. The Council votes by a qualified majority and the EP must consent to the conclusion of the treaty. The EEAS only has a role re foreign policy issues, as distinct from other EU external relations like this area. Would the 2014-21 EFTA Financial Mechanism have to be renegotiated, or is it possible that it could be left as is, and we and the EFTA states and the EU would agree a separate contribution by the UK, as a UK Financial Mechanism alongside the Norwegian one? This would be a bit messy, since Norway provides a portion of the EFTA Grant as well as its own Grant, while we would just be making the one contribution - but might it be doable this way? Article 116 EEA says all EFTA states must contribute. However I suppose a Protocol on UK EEA membership could amend the EEA to specify instead that as a derogation a separate UK financial facility will be made. Thanks, so this (the EEA Financial Mechanism 2014-2021) is one thing that would have to be re-negotiated in the event of an EFTA-EEA Brexit, I presume. Does not the EEAS have a role through the EEA Joint Committee? 'Before the Lisbon Treaty, the EEA JC comprised the ambassadors of the EEA EFTA States and representatives of the European Commission. In accordance with the Treaty of Lisbon, responsibility for coordinating EEA matters on the EU side was moved from the European Commission to the European External Action Service following its launch on 1 December 2010.' (http://www.efta.int/eea/eea-institutions/eea-joint-committee) I gained the impression from their addition of Article 19 to Protocol 31 in 2000, that the Joint Committee must have some powers to make decisions on financial matters. Officially, at least, all EU external relations proposals not connected with foreign policy are still solely authored by the Commission, not the EEAS. Article 2(1).f of the EEA Enlargement Agreement (http://bit.ly/1T6U1HS) amends Article 126(1) EEA to remove Austria, Finland and Sweden from the EFTA side of the territories to which the EEA Agreement applies. It also looks like it was through Article 2(1).a that Austria, Finland and Sweden were transferred from the EFTA side of the list of Contracting Parties to the EEA Agreement to the EU side. This seems to confirm that there was felt to be no need to amend the EEA Agreement in 1994-5 when these countries were acceding to the EU. I find it surprising that it took so long to tidy the Agreement up, but I suppose that it is a lot of work to amend a treaty with so many Contracting Parties. According to the EFTA Bulletin 2 - 2002, 'Activities and Financial Contributions under the EEA Agreement', (http://bit.ly/1SZgcOz) pp 45 & 47, the EU took over the Financial Mechanism obligations of Austria, Finland and Sweden. Would you be able to tell me by what mechanism this was done, and by whom the decision was taken? Thanks for that. The financial contributions were transferred in the 1994 accession treaty. This was foreseen in the final act of the EEA too, ie in the declarations. I wouldn't say the EU 'took over the contributions', rather that they formed part of the new Member States' contributions to the EU budget after the 1995 enlargement (as I understand it). Thanks, I was repeating what was in the EFTA Bulletin (p. 45), but your way of putting it may well be more precise. Article 67. The Kingdom of Norway's share in the financing of the payments still to be made after its accession on commitments contracted under Article 82 of the Agreement on the European Economic Area shall be borne by the general budget of the European Communities. Article 68. The Kingdom of Norway's share in the financing of the financial mechanism provided for in Article 116 of the Agreement on the European Economic Area shall be borne by the general budget of the European Communities. and similarly for the other three acceding countries (Articles 82 and 83 for Austria etc). This is an excellent blog and provides some much needed legal commentary on what invoking article 50 might mean. I am interested to see that you believe article 50 is vague regarding whether or not invocation can be withdrawn. I think we can both probably agree that there is good reason for this. In practise though, what would happen if the UK did withdraw it's article 50 notification - and say atleast one member state took the view that this was not legal? What would happen next? I can imagine it would not just be a dispute between Member States. A fervent supporter of the Leave side might go to court in the UK (or a fervent Anglophobe might go to court in France) to argue this point. The national court could ask the Court of Justice to answer. Can the notification take any form? For instance, Cameron attends the European Council meeting on 28 June and (informally) SAYS what the UK will do, which they construe as triggering Art 50. But Cameron has said that he won't make a notification, he will leave it to the next Prime Minister to do that. Under Article 50,on the date the Treaties cease to apply to the Member State, does this mean the Member State is no longer committed to the remainder of the EU budgetary period (which it was previously committed to). Presumably budget contributions are covered by a Treaty which ceases to apply? Thanks for your question, Nick. The withdrawal agreement is likely to deal with the specifics of the budget contributions. I expect that if Brexit goes ahead, there will be a year or two of transitional rules as UK contributions wind down, in particular since the current EU budget period finishes in 2020. Do the Treaties which cease to apply include the commitment to contribute to the EU budget? That commitment will end (subject to the transitional rules - see my answer to your other question) - unless the UK agrees to make contributions pursuant to another treaty, of course. I would be interested in views on what "framework" means in Article 50 and who decides what this is without negotiation on the matter. I think 'framework' is a deliberately vague term that leaves a lot to political discretion. Implicitly the Treaty seems to assume that the departing Member State and the remaining Member State have agreed on this 'framework'. That would in turn imply some prior negotiation on that point. But again, it's deliberately vague. Does it follow from your reply that, at least in theory, it would be within Article 50 for the "framework" to include a new trade agreement negotiated before the UK leaves? Yes, although the EU trade Commissioner has taken the opposite view. With regard to the last question from "anonymous". I have asked the General Secretariat of the European Council to provide further clarification on various aspects of Article 50 and received the following reply: "We would like to inform you that it is not the Council policy to either confirm or infirm interpretations of the Treaties on subjects it has not yet discussed.". Since this is not especially helpful I am lobbying Parliament to seek further clarification on the text within Article 50. Therefore my question now is if there is any precedent for the EU to clarify the terms set out in treaties where member states wish to effectively "test" the interpretation of the treaty; the case in point being given article 50? The opinion of Council staff has no legal force. The only definitive interpretation of Article 50 could come from the Court of Justice, if a case reaches it. I note that there are currently legal challenges in place with regard to the Government invoking article 50 without Parliament's consent. Do you have a view on whether or not a successful legal challenge prior to notification would effectively thwart any subsequent challenge; in the case of article 50 having been invoked (following Parlimentary consent) and another group wish to contest the outcome of negotiations by launching a new legal challenge requesting that Parliment once again be asked to approve the final deal. In effect - would the EU/ECJ have sufficient grounds to point to the conditions of article 50 having been already met (in accordance with its own constitutional requirements paragraph) if Parliament had previously successfully voted on invoking article 50? Parliament would have to approve any final deal on the basis of its general power to approve treaty-making by the UK government set out in a 2010 Act of Parliament. I don't see how EU law would be relevant to that particular issue. But I can see the legal problem if (a) Parliament has to approve the notification under Article 50, (b) it does so, and (c) it then refuses to approve the final deal pursuant to the 2010 Act. In that case the UK will be leaving the EU anyway on the two-year deadline date without any agreement with the EU in place. One issue here is however whether Parliament's approval to the Article 50 negotiations could be made subject to some form of conditions. There is also the underlying question of whether an Article 50 notification could be revoked. If so then Parliament would arguably have three options at the end of the negotiations - the third being to instruct the government to withdraw the notification - and the question of whether it must have power to decide on giving the notice in the first place becomes less significant, and should perhaps receive a different answer. I hope this doesn't sound too silly... But as a follow up to my previous question you will be aware of the action that Jo Maugham is taking in the Irish courts with regards to the rights of withdrawing an article 50 notification. If we imagine that this is referred to the ECJ who rule that an article 50 notice could be withdrawn, and then the UK parliament vote to reject the final deal (perhaps anticipating that this will necessitate the government revoking the A50 notification), isn't this in itself enough to legally argue that the UK is Failing to "withdraw from the union within its own constitutional requirements"(article 50 text). And therefore an article 50 withdrawal notice becomes an irrelevance... Not only could UK "remainers" argue this but the European council itself could argue that the notification process has not been met and reject the application... Yes clutching at straws but I hope you see the point.. The European council has a duty to ensure that an article 50 notification meets its own treaty criteria... For instance you and I simply could not turn up at Brussels and post a notification! Thanks for your comment, James. Yes, I am aware of that legal action and will probably write about it soon. I think if the notice is revocable the simplest way forward is to see how Parliament votes up until the actual Brexit Day. I would expect various attempts to table an amendment or motion of withdrawing the notice, in particular when it comes to the vote on the final deal. If they are all defeated, then the notice stands. If one of them passes but the government refuses to implement it, then it gets very complicated. I haven't really thought through the logistics of what happens then. If the government acts on it and withdraws the notification then it's simple legally speaking. In any event I think it is more likely to be an issue of whether a further referendum on the final deal should be held. It's an Advocate-General's opinion, not a preliminary ruling of the court. I think we should wait to see what the Court says.